Unity is a Lottery with a difference! 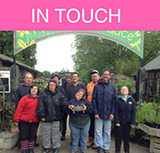 You can support our Charity, Canterbury Oast Trust by playing the Unity Lottery each week. For every £1 that you play, Canterbury Oast Trust receives 50p, enabling us to continue providing life changing services to support adults with learning disability. For just £1 per week, you will be allocated with a six digit Unity Lottery number. (You can purchase more than one entry if you wish.) Every Saturday, the lucky winners are selected at random, and the prize cheques are issued and posted directly. You must be 16 or over to play. Winners have to match 3,4,5 or all 6 digits of the winning number, in the correct place in the sequence. You can find out more, and enter via the link below.